UPDATE: Apple’s official stance on the removal of the WikiLeaks app is that “it violated [their] developer guidelines,” according to the New York Times. Apple spokeswoman Trudy Muller added that “[a]pps must comply with all local laws and may not put an individual or group in harm’s way,” which suggests that the guideline it violated wasn’t the one related to charitable donations. Given enough time, it seems like everyone will eventually become entangled in the ever-sprawling WikiLeaks story, which began back in late November when the whistle-blowing site started publishing a trove of secret U.S. diplomatic cables. 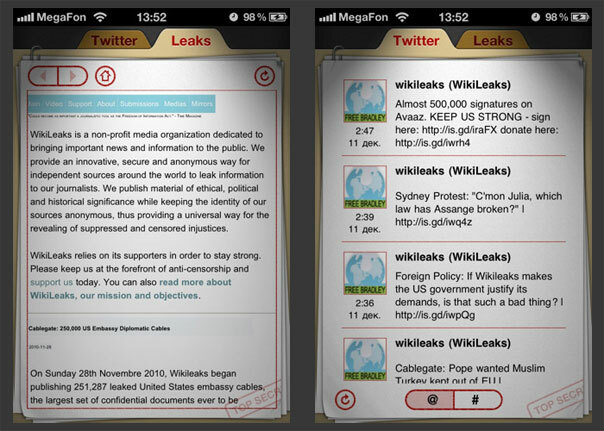 Today, it’s Apple’s (s aapl) turn, as overnight, an unofficial WikiLeaks iOS app was pulled from the App Store after being approved only last week. Before you run out and fire up your Low Orbit Ion Cannon to wreak DDOS justice on Cupertino servers, it’s important to point out censorship isn’t the only suspect in this rejection case. Like with most things Apple does, it’s not immediately obvious what the reasoning is behind this latest action. Certainly Apple has been known to remove apps containing content the company doesn’t approve of, and while that may be what happened here, as TechCrunch claims, it’s not necessarily so. The app may simply have violated App Store guidelines around collecting donations. According to its iTunes page, the app sold for $1.99, with one dollar of every purchase being donated to “organizations that work to promote the future of online democracy.” This might be read as a violation of the App Store Review Guidelines, which state that “[a]pps that include the ability to make donations to recognized charitable organizations must be free” and “[t]he collection of donations must be done via a web site in Safari or an SMS.” Of course, that guideline could also be read as only applying to apps that use in-app purchases to collect money, rather than a developer just donating part of his proceeds. The guideline is vague, perhaps by design. We may never know why this particular app was pulled from the store. Resubmission as a free app, or removing mention of donations could remedy the problem, if indeed Apple isn’t just taking issue with the nature of the app’s content. If not though, you can always just open up mobile Safari and head over to http://wikileaks.ch or http://liebermanforpresident.org to view the cables there. The great thing about the Internet, as activist John Gilmore famously put it, is that “[t]he Net interprets censorship as damage and routes around it.” Apple devices aren’t immune to this rule. At least not yet. It could be the ignoranuses commenting here would be whining about something else – if not the whine de jour? It could be simply the illegality of allowing access through the iOS to stolen, classified data, something that’s irrelevant to the fact that there are other sources for the data. And keep in mind that corporate secrecy is a core value at Apple. What if someone penetrated Apple security and posted online all the executive email at Apple for the last five years? We’d see a very unhappy Steve Jobs. There are also practical ethical issues. After World War I there was ill-considered outrage over the fact that among the complex of reasons for the war were secret treaty provisions that pulled nations into the conflict. But the opposite is also true. Making diplomacy too open means that nations can’t be covertly honest with one another or work out their differences in secret. It politicizes diplomacy. That’s particularly true in the Middle East. Israel and the various Arab countries have always had ‘back doors’ though which they communicate to prevent another bloody war. Exposed, radical Islamist groups could use the existence of those contacts to stir up violence and replace a tolerable government with something much worse. No, in then end rhetoric about promoting “online democracy” is as silly as claiming that kings or dictatorship are ‘better’ than weak and divided democracies. Some horrors against humanity have been the responsibility of a closed elite that should be exposed. Other horrors are committed by angry and democratic masses of people who know or think they know too much. A lynch mob is a far more open, participatory democracy than any courtroom, but that doesn’t mean it isn’t evil. That’s why AIR (All India Radio) wisely held back (censored) news of Gandhi’s assassination until they could report in the same newscast that his killer was a radical Hindu rather than a radical Muslim. The latter would have triggered riots in which tens of thousands of people might have been killed. To get specific about these leaks, among other things, these leaks reveal that the leadership of Arab countries are every bit as hostile toward a nuclear Iran as Israel is. Everyone who understands Middle-eastern politics knows that, but revealing it in a way the infamously stupid “Arab street” can see could have disastrous results, particularly if somewhere in the cables are hints that Saudi Arabia and Syria were open to giving covert flyover rights to Israeli fighters. And, I might add, given our current weak-kneed administration in the White House, I’m all for Arab countries pressuring a spineless U.S. to do something constructive to prevent a country, whose leaders are whacky even by Middle-eastern terms, from going nuclear. It’s interesting that in this matter the French government is displaying far more good sense and backbone than our own. Leaks aren’t all bad. Specific and carefully targeted leaks can be good because they reveal something that needs to see the light of day. The Pentagon Papers, for instance, revealed just how ill-thought out and heavily politicized the Vietnam policy of JFK and LBJ had been. But massive dumps like this can’t help but do more harm than good. They’re less about informing than about a foul, smash-and-burn mindset, at Wikileaks. Umm, you know that less than 1% of the cables have actually been released by Wikileaks, right? Tell me again how “foul, smash-and-burn mindset” is applicable. Of course, it could also be a “trademark” issue. A few months ago there was an interview with Steve Jobs – http://d8.allthingsd.com/20100607/steve-jobs-at-d8-the-full-uncut-interview/ – who mentioned that we should be getting news from an editorialized source, like the NY Times. I would think this would have something to do with the removal of the app. After all, aren’t we much safer with edited news? And yet Apple still blocks the presses ability to provide a subscription model.